Anthony Joshua has just retained his heavyweight titles to stake his claim as the best boxer in the world but his friend and Manchester United star Zlatan Ibrahimovic has a few tricks to team him. 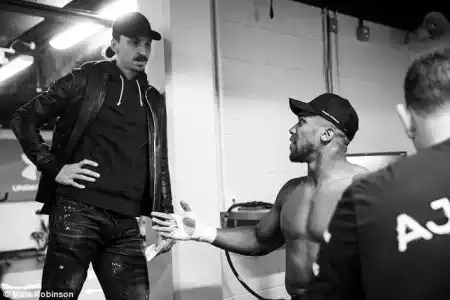 Ibrahimovic was at the Principality Stadium to support his friend Joshua who beat Carlos Takam via a 10th round knock-out to win to win the bout on Saturday, October 28. During an interview at the fight, the Sweden legend joked that he can teach Joshua some Bruce Lee skills if the boxer wants to learn. “I have only to learn from Joshua but if he wants to learn from Bruce Lee skills, I can teach him,” the 36-year-old told iFL TV. Ibrahimovic earned a black-belt in taekwondo as a 17-year-old in his hometown of Malmo and in 2010, he received an honorary black-belt from the Italian national taekwondo team. Controversy trailed Joshua’s win against Takam as the referee was booed for ending the fight early but Ibrahimovic believes it was the right decision. “No, the referee is there to protect both the fighters. The guy was getting a beating and the referee was protecting him,” the striker said. For Joshua’s next fight, Ibrahimovic wants to see Joshua fight American boxer Deontay Wilder.